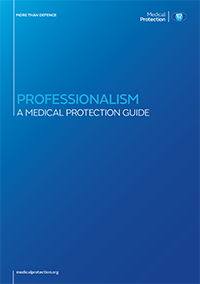 Welcome to Professionalism - a medical protection guide, a publication that takes a closer look at what it means to be a professional. Increasingly I hear from members whose experience is that patient expectations are growing: the patient is encouraged to see themselves as a consumer of health services, and this has led to a change in approach and ethos. But a lasting constant in these times of great change is your professionalism – the core values, beliefs and behaviours around duty, integrity, honesty and clinical competence that are as important as ever. With higher expectations, patients are more likely to be disappointed and then complain about their care; certainly, I hear concerns from members that the gap between expectations and what they can realistically deliver is widening. In such times your professional attributes can really come to the fore and make all the difference when under pressure. This booklet is designed to get you thinking about what it means to be professional; in particular the characteristics and behaviours that uphold professional qualities. We also take a look through history to place modern expectations in the context of changing societal attitudes to the definition of professionalism, and our timeline makes for interesting reading. The GMC’s expectations are summarised in the second chapter, and we look at how they should be applied in scenarios, through a number of anonymised case studies from our own files. I hope you find this booklet a thought-provoking read but also one that offers useful practical advice. As ever, if you have any queries or suggestions I would like to hear from you. You can either download a PDF version of the guide by clicking here or use the links at the bottom of each page to read online.